A state-of-the-art robot that kills bacteria and viruses with ultraviolet light has entered the fight against the spread of germs and infections, especially ones that are resistant to antibiotics, for the first time in South Africa. The robot is currently being trialled at Netcare Blaauwberg Hospital in Cape Town. “In South Africa and around the world there is a growing problem with antibiotic resistance. It is essential for us to focus on preventative measures, instead of just throwing bigger and better antibiotics at the problem especially as pharmaceutical companies are struggling to develop new antibiotic drugs,” says Dr Ricky Dippenaar, head of the neonatal intensive care units (NICUs) at Netcare Blaauwberg and Netcare N1 City hospitals. 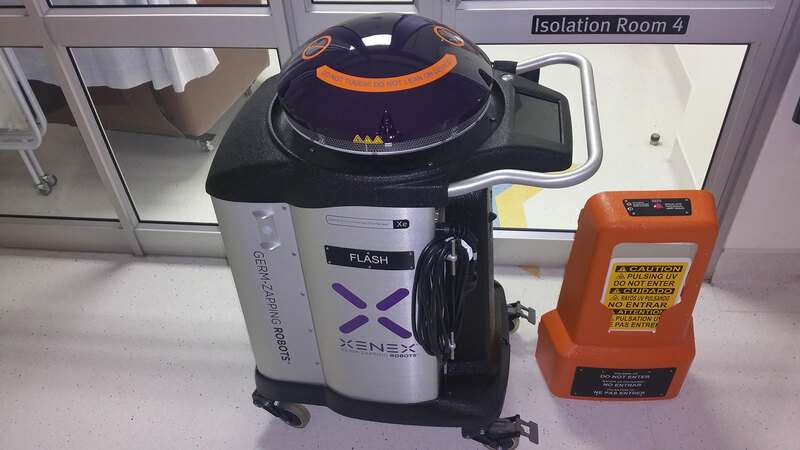 The Xenex robot is about the size of a large vacuum cleaner, but much better looking. The technology was delivered to Netcare Blaauwberg Hospital last Wednesday and put through its paces. The floor plans of each room within the NICU where it will be used had already been programmed into the device. When switched on, a dome-shaped ‘head’ emerges from the robot. This sits on top of a ‘neck’ of lamps that emit pulses of high-intensity xenon ultraviolet (UV) light that destroys bacteria, mould and viruses. There are three spectrums of UV light: A, B, and C. We use suntan lotion to protect ourselves from the A and B spectrums. The earth’s ozone layer protects us from UV-C light, which is what the robot emits. “Because bacteria have never been exposed to this frequency of light, it means they are facing a new environmental factor they are not able to survive,” says Dr Dippenaar. “The light passes through the cell walls of bacteria, mould and viruses and destroys their DNA, preventing them from replicating. “This sophisticated equipment is something completely new. We have used UV light in various medical applications before, but never with this amount of research behind it and with this degree of sophistication. 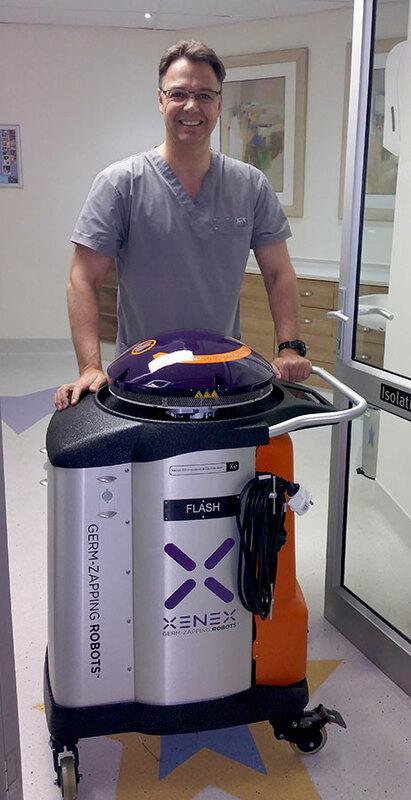 This robot has proven so effective in the USA that it is deployed in some of the leading hospitals, and its introduction to South Africa is to be welcomed,” says Dr Dippenaar. After contacting the African distributors of the robot, the company arranged for Dr Dippenaar to be invited to a healthcare facility in the US, where it is being used. 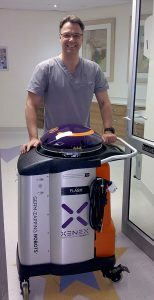 Dr Dippenaar subsequently procured the use of the robot in a four-month-long pilot study at Netcare Blaauwberg Hospital, to test what has already been proven abroad to be a very effective machine. He is confident it will show good results and be of benefit to not only the hospital, but also the African healthcare industry. This technology will be used in one of Netcare Blaauwberg Hospital’s most sensitive environments, the NICU, where premature and other compromised babies are being cared for. In that environment, the highest risk area is where the mothers’ breast milk is prepared. The robot will be used in addition to the normal cleaning and disinfection protocols. No staff, babies, mothers, or milk will be exposed to it. It is placed in a room, switched on, and left for a couple of minutes to “wash” every surface with pulses of light, getting into those nooks and crannies the cleaning cloth may not have reached. Dr Dippenaar explains that resistance to antibiotics is developing in part because of the over-prescription of antibiotics to fight simple infections like coughs. This creates an environment in which these highly intelligent organisms are able to adapt and become resistant to antibiotics. These resistant organisms are often referred to as “superbugs”. Other countries around the world have the same problem. In some developing countries this is made worse by the fact that antibiotics are not regulated and can be purchased over the counter. “We applaud Dr Dippenaar’s initiative to pilot this highly effective technology at Netcare Blaauwberg Hospital, as it helps us make our NICU environment super sterile” says Netcare Blaauwberg Hospital’s general manager, Dirk Truter.